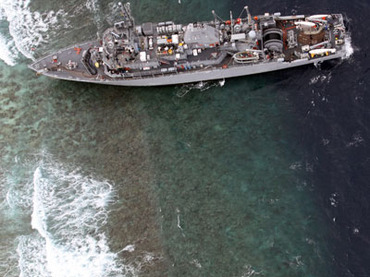 A US Navy minesweeper has run aground on a UNESCO protected coral reef off the Philippines. The unique ecosystem “with a very high density of marine species" may suffer irreversible environmental damage. The ship hit the coral reef in the Tubbataha National Marine Park and ran aground on Thursday due to bad weather. The navy tried to pull the USS Guardian off the reef at high tide on Friday; however the mission was failed, the BBC reports referring to a statement from the US Navy. The ship remains stuck in the Sulu Sea south-east of Palawan island. The US Navy reported that the ship had 79 crewmembers aboard at the time it hit the reef. As a precautionary measure 72 of them were evacuated on another vessel. "A small complement of engineering and bridge personnel will remain aboard and work with a US Navy team in an attempt to free Guardian with minimal environmental impact," the US Navy statement said. According to the local media Philippine coast guards and nature park ranger were sent to the site to check whether any significant damage was made to the reef. “The site is an excellent example of a pristine coral reef with a spectacular 100-m perpendicular wall, extensive lagoons and two coral islands,” according to UNESCO. The cause of the grounding is currently under investigation, the US Navy said.